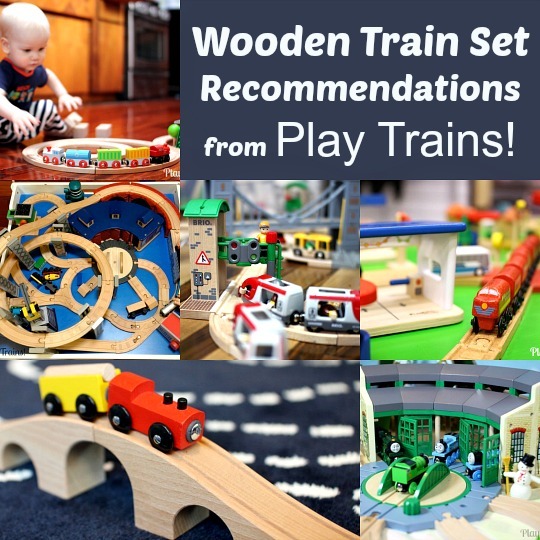 One of the most common questions I get is, “Where do you find all of the freight cars for your wooden trains?” And it’s no wonder, because many of our wooden train activities make use of freight cars to hold seasonal objects, sensory and learning materials, and other fun stuff. Here, I’ll answer the question by pointing you toward some great wooden train freight cars with removable freight from quality brands we recommend. 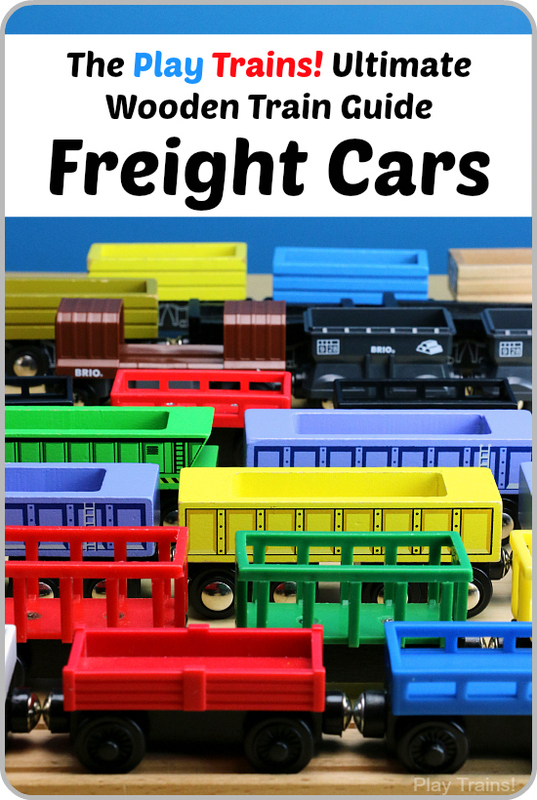 From the fine motor activity of loading and unloading the freight, to the inspiration different kinds of freight objects can provide for pretend play with a child’s trains, freight cars / cargo cars / wagons / trucks with removable freight add a lot of possibilities and value to train play. We have a very wide range of freight cars that we’ve collected over the years. The ones in bold are freight cars and sets that we either own or have played with in the past. Others I recommend based on the knowledge I’ve gained from playing with all the others. I’ll organize them by brand so that I can give some general comments about each brand. There are many more wooden train freight cars and freight trains that either don’t have removable freight, or have removable freight, but can’t hold any other kind of freight than the piece they’re sold with (due to the freight being held on by pegs, usually). These are fun, but have less play potential due to their lesser versatility. I will include the best of this type of freight car in an upcoming Ultimate Wooden Train Guide post about freight train sets. Thomas Wooden Railway makes some of our favorite freight cars. While they are generally plastic cars on a wooden base, the quality and look are still appealing to us, so that’s what we’ll reach for most often. 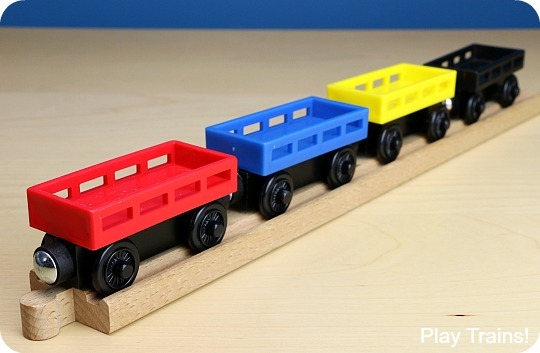 Black Cargo Train Cars (set of four): A quick way to grow your wooden freight car collection! 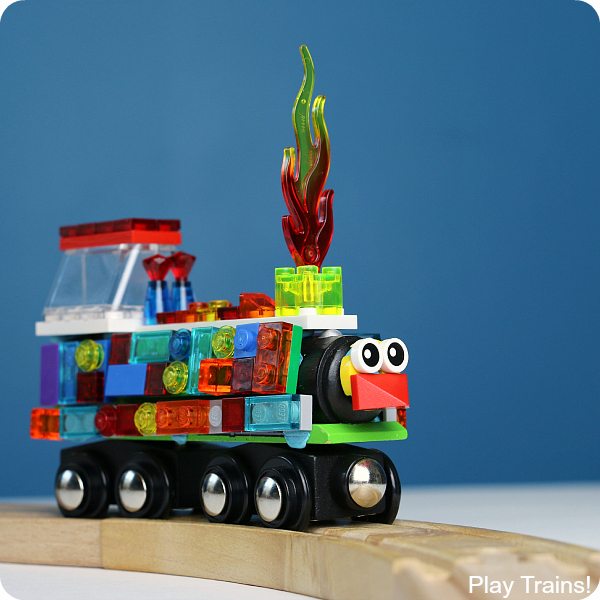 This is one of our favorite styles of freight cars (as pictured above). They have low sides, which are nice when you want to see your freight from the sides. Sodor Bakery Delivery: A nice set with three different kinds of freight cars plus removable bakery ingredients for freight. We own the Cookie Factory Cargo Pack with Rickety Troublesome Truck, which is the predecessor of this and the Troublesome Trucks and Sweets pack I’ll talk about below, and we love it. “Bakery deliveries” is a really fun scenario to play with the trains, and you can relate it to real baking. We’ve even made the cookie recipe that comes on the back of the Cookie Factory Cargo Pack and driven the cookies around in the circus cars above with the cookie factory freight cars. Good — and yummy! — times. Crawly Critters Cargo Car 2-Pack: These are great if you have an insect lover, or if you have a kid who loves the color blue — the car with the removable freight in this pack is blue! It’s the blue car pictured in the image above. Oil and Coal Cargo 2-Pack: The high-sided, green wooden coal car features removable freight. 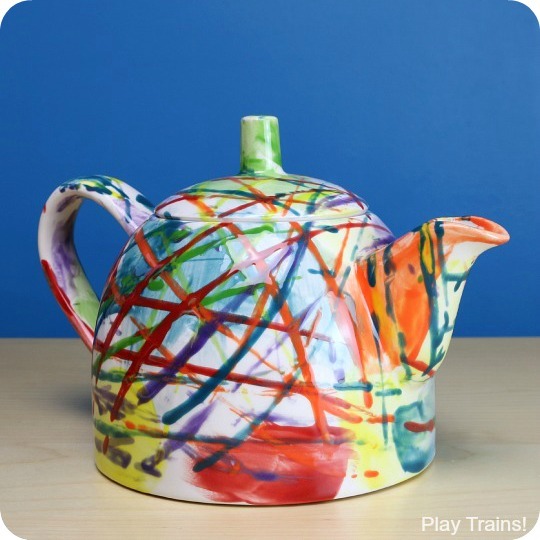 Perfect for a child who likes playing with both “Steamies” and Diesels. Santa’s Little Engine: Thomas pulls a green short-sided freight car with a removable sleigh (including Sir Topham dressed as Santa). Peter Sam’s Dynamite Delivery: Includes Peter Sam and two freight cars, one of which — a short-sided red one — has removable dynamite cargo. Great for fans of Blue Mountain Mystery! Rusty to the Rescue: Rusty pulls two freight cars — including an orange, short-sided car with removable quarry supply cargo. Another one for Blue Mountain Mystery fans. 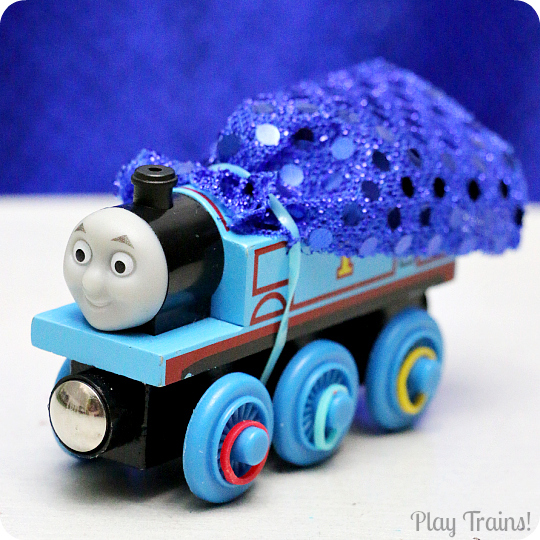 Thomas’ Balloon Delivery: A garland-decorated Thomas pulls a short-sided red car with removable balloon freight. Perfect for a birthday gift. Thomas’ Castle Delivery: Thomas — wearing a banner with the Earl of Sodor’s crest — comes with a purple circus-style car with removable armor freight. Thomas’ Pig Pick-up: Muddy Thomas pulls two freight cars, including a red, short-sided one with removable wooden piglets. 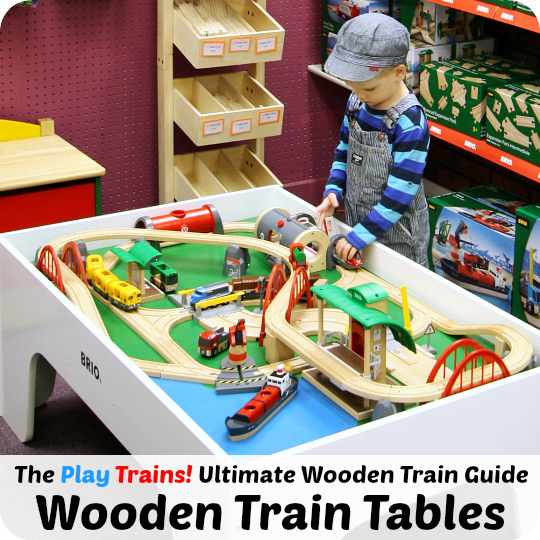 The Imaginarium line of wooden trains at Toys’R’Us produces another one of our favorite types of wooden train freight cars. 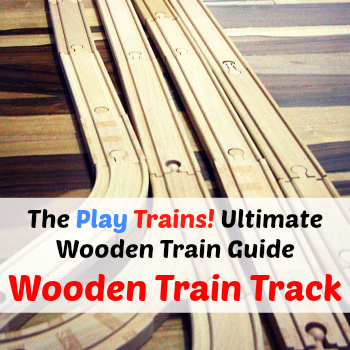 They’re high-sided wooden freight cars that are detailed to have wooden “board” sides. 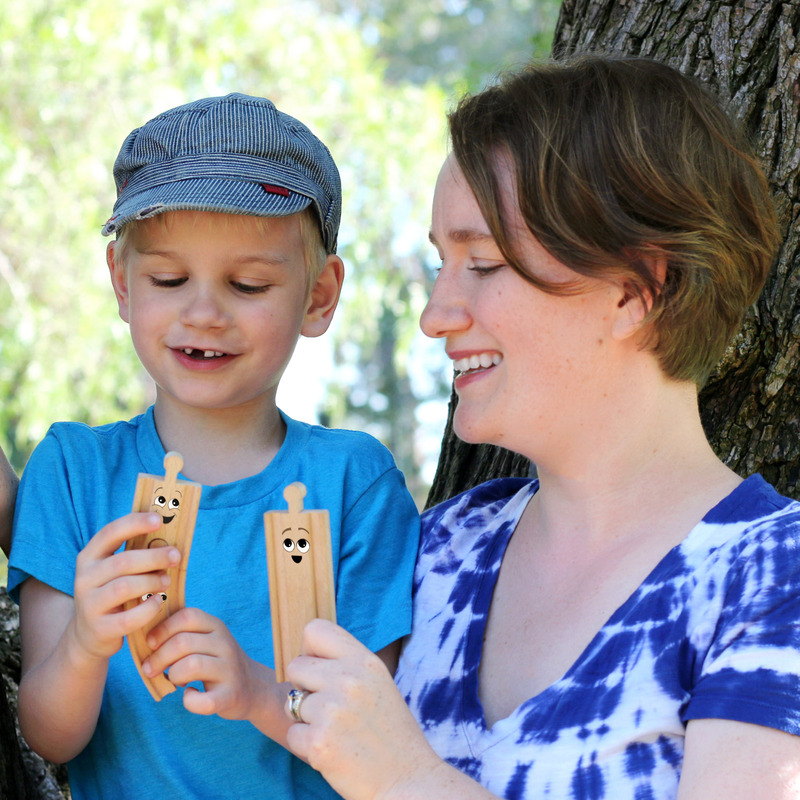 You can find them in different colors in their different wooden train sets, but our favorites — a blue one and a finished wood one — came in one of our favorite Imaginarium sets, the Timber Log Train Set. Another strong point about these freight cars is that they’re perfect for adding our DIY Troublesome Truck Face Stickers to! Brio makes some very interesting freight cars! I love how realistic and functional they are. Almost all of them have removable freight. 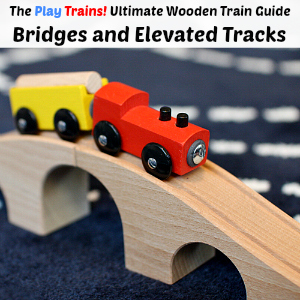 Brio wooden trains have a lot of plastic, but it’s very high-quality plastic and the quality of the trains in general is top notch. Boxcar: I love how this green boxcar slides open in two directions to reveal the removable freight inside! 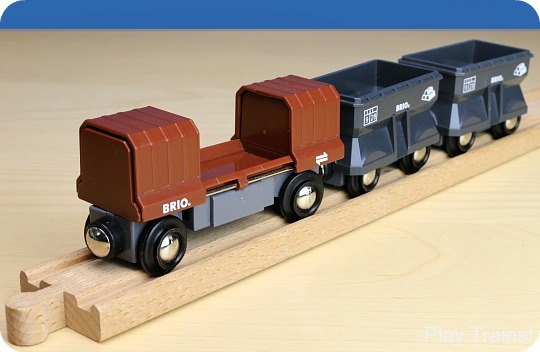 Brio Boxcar Train: This comes with a diesel engine and two brown boxcars (same as the one above, except a different color). It’s a good deal if you want more than one boxcar and a new engine to pull them. Brio Gold Mining Train: This is a nice one, especially if you also have the Thomas Wooden Railway Gold Mine Mountain set. It comes with a red diesel engine (the hood of which lifts up so the child can “repair” the engine) and two dark gray freight cars with removable gold freight. Brio Farm Animal Train: This farm train comes with a green diesel engine and two yellow livestock cars, each with a fold-down ramp for the wooden cows to climb up into the cars on. More train car packs that include freight cars with removable freight include the Lumber Loading Wagon (a longer, green freight car with three individual logs to load) and the Handy Coal Wagon (same style as the gold mining train cars above, but brown with black coal dust). 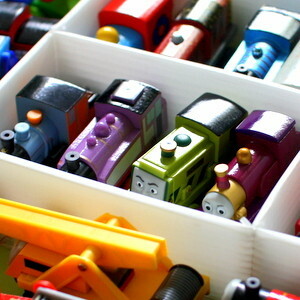 These are the wooden trains you can buy loose from a display box at Target. There are generally a few different freight cars with removable freight in a couple of styles and a few different colors. The selling points on these are a) the price (just over $3 last I checked) and b) they’re longer than almost any other freight cars, so you can fit things in them that don’t fit in the other ones. The quality isn’t as good as the above brands, but the price and convenience are right. Bigjigs is another company that makes a lot of specialized wooden freight cars with removable freight. They’re an excellent choice — less expensive than some of the other brands but still pretty good quality. Car Loader: Comes with an engine and two flat cars with small cars (of the drive-down-the-highway kind) on them, plus a car ramp and two pieces of track. Big Coal Wagon: This wagon comes with two triangular lumps of coal for freight. It’s a long, long freight car that has the longest, largest area for holding freight — great for objects that won’t fit in our other freight cars! Graham’s Girders Wagon: This wagon is appears to be similar to the Big Coal Wagon, but in a more attractive (but maybe slightly less realistic?) blue color. It comes with two long, skinny girders for freight. 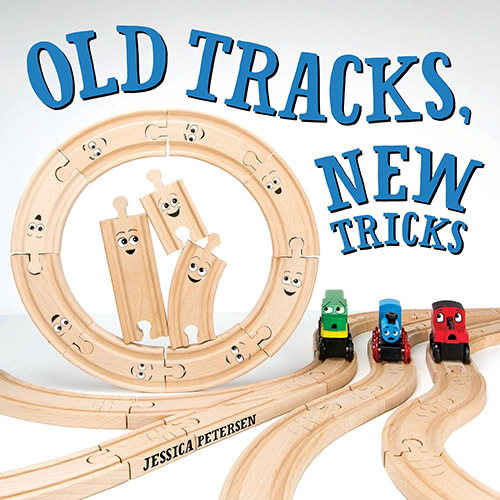 We just got our first set of Orbrium wooden trains (haven’t tested them on the tracks yet), but we’ve ordered their track in the past and been pleasantly surprised at the quality. 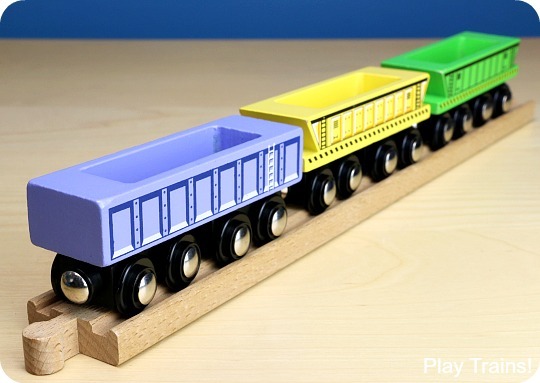 5 Piece Cargo Train Car Set: This set comes with five different freight cars, and gets a lot of positive reviews, although according to a couple of the reviews, the magnets may not be as strong and the wheels seem a bit more wobbly. 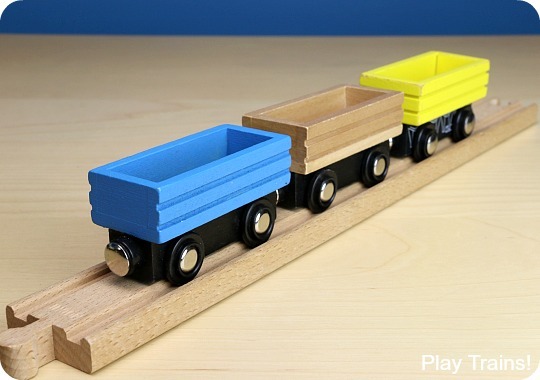 4 Piece Unpainted Wooden Train Cars: This is the set I mentioned us having above. I was very excited to see some unpainted train cars back on the market (Thomas Wooden Railway used to make them, but sadly no more), although I can tell already the quality is just not the same. They are, however, slightly less expensive than what I paid for the unpainted Thomas box cars and tank cars we have, and they come with an engine (with an oddly short boiler) and three different cars, which is fun. One of the cars is an open freight car that you could put freight in, so I thought I’d include it here. This guide will be expanded with time. Have a question I didn’t answer? Ask in the comments, through our Facebook page, or by email! We got a small Ikea train set for my son when he was eighteen months, and he liked playing with it a lot, so I was wondering what fun additions I could get for him for his second birthday, coming in a couple of months. 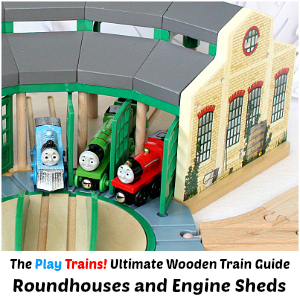 I spent a couple of hours this morning, reading your site, and I feel infinitely more educated about toy trains. And excited too! Thank you for such a great resource.